Nothing satisfies like Omaha Steaks Crock-Pot Meals - and there's never been a better way to keep them on hand. 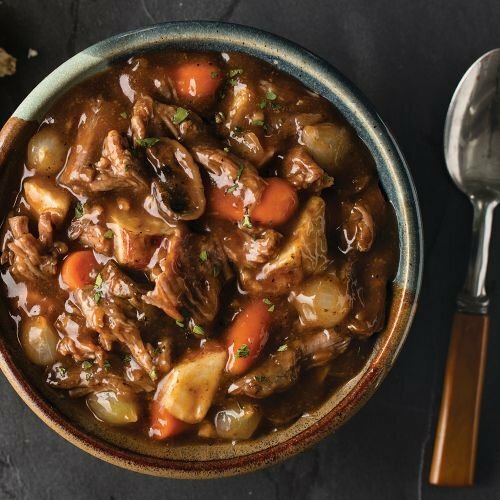 Our Crock-Pot Meals Assortment boasts four no-prep freezer-to-slow cooker meals, with flavors ranging from rich, meaty Beef Bourguignon to homestyle Chicken and Dumplings, and more. PLUS, lock in the very best price on this family-friendly collection with Autoship & Save, our NEW no-hassle automatic delivery option. Set up Autoship to have this amazing combo delivered as frequently as you'd like - you'll even save 5% on every subsequent shipment. BONUS: 450 Steaklover Rewards points are FREE with your purchase (that means FREE food!). INGREDIENTS: Beef Sirloin, Burgundy Cooking Wine (Burgundy Wine, Salt), Roasted Red Skin-On Potato Chunks, Baby Carrots, Water, Onions, Fire Roasted Marinated Portabellini Mushrooms (Portabellini Mushrooms, Canola Oil And Olive Oil Blend, Balsamic Vinegar, Salt, Pepper), Beef Broth Flavor (Beef Broth [Salt], Natural Flavor), Corn Starch, Garlic, Tomato Paste, Rendered Bacon Fat, Canola Oil, Sea Salt, Soy Sauce (Water, Wheat, Soybeans, Salt, Alcohol, Vinegar And Lactic Acid), Spices.